The Pristine Water E-Coag ETP, uses the Electrocoagulation method, which is a technological enhancement on the conventional chemical coagulation method. Water contaminants such as ions of heavy metals and colloids are primarily held together by electrical charges. In the Pristine Water Electro Coagulation system, these contaminant molecules are destabilized by the addition of ions having a charge opposite to that of the colloid. The destabilized colloids become larger particles and are aggregated and subsequently removed by sedimentation and/or filtration. The anodes used in our systems are known as “Sacrificial anodes” as they dissolve during the Electro coagulation process. Periodic easy replacements of these anodes are the only maintenance that the system needs. An electro coagulation system has a reactor, with electrodes connected to a power source. When a certain voltage is reached between the electrodes, reduction processes on the cathode and oxidation processes on the anode begin (generating the ion Al3+ if the anode is aluminum and Fe3 if it is steel). This is followed by ionization, destabilization, oxidoreduction, electrolysis, free radical formation, electromagnetic field formation, and emulsion breaking and separation. At the anode, the generation of oxygen resulting from the oxidation of the water causes the formation of H+ ions which, due tot the charge, are attracted to the cathode. At the cathode, the reduction of water to form hydrogen causes the formation of hydroxyl (OH-)ions which, unlike the H+ ions, are attracted to the anode. Chemical coagulation has been used for decades to break down and the colloids and suspensions using coagulants like alum, lime and polymers to cause precipitation of soluble metal species, as well as other inorganic species, thereby aiding in their removal through sedimentation or filtration. These processes, however, tend to generate a lot of sludge with a high water-content which is slow to filter out and difficult to dewater. Chemical coagulation also increases the TDS (Total Dissolved Solids) of the purified water making it unacceptable for reuse within industrial applications. Electrocoagulation can often neutralize ion and particle charges, thereby allowing contaminants to precipitate, reducing the concentration below that possible with chemical precipitation, and can reduce or replace the use of expensive chemical agents (metal salts, polymer). In Pristine Water E-Coag ETP system, the characteristics of the electrocoagulated floc differ dramatically from those generated by chemical coagulation. 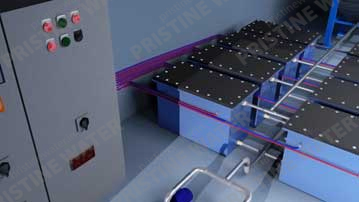 An electrocoagulated floc has less bound water by upto 98%, is more shear resistant, and is more readily filterable. In the Pristine Water E-Coag system the effluent to be treated enters the reaction tank. Multiple reactions take place simultaneously. First, a metal ion is driven into the water. On the surface of the cathode, water is hydrolyzed into hydrogen gas and hydroxyl groups. Meanwhile, electrons flow freely to destabilize surface charges on suspended solids and emulsified oils. As the reaction continues, large flocs form that entrain suspended solids, heavy metals, emulsified oils and other contaminants. The flocs that form float on the top which is removed using a sludge removal system. The sludge that settles at the conical bottom of the tank is removed through drain valve. A scraper is provided that ensures that the electrodes are kept free of any sludge or flocs sticking to them. In most Electro coagulation systems, the anodes develop deposits on them and this adversely affects the efficiency of the electro coagulation process. The Pristine Water E-Coag ETP, uses reverse polarity. By reversing the current automatically and periodically, the scaling on the cathode is reduced substantially. Additionally, for automatic mechanical cleaning of electrode a scraper mechanism is provided. The treated water is extracted using a simple filtration system. EC uses a proprietary design and electricity to treat a wide range of differing waste streams containing heavy metals, virus, bacteria, pesticides, arsenic, MTBE, cyanide, Biochemical oxygen demand (BOD), Total dissolved solids (TDS), and Total suspended solids (TSS). It is used to treat municipal, industrial and commercial wastewater.